A letter to Sonoma Print Shop customers — Frye's Printing, Inc.
After almost 40 years of owning and operating Sonoma Print Shop, we have decided to retire, effective March 20th. Our building has been sold and we have contracted with Frye's Printing in Napa to take over servicing our customers. Frye's Printing is family owned and operated and has been in business for 37 years. They are larger than we are, so can do all of the types of work that we do plus a lot more. They have multi-color large format presses so are able to print large quantities of full color work. They do foiling, embossing and die-cutting, as well as blueprinting and large format digital color printing. Kevin Frye and Rob Frye will be your personal contacts for any questions you might have. They will be taking over all our physical and digital files. The phone number and email address will remain the same. It has been a pleasure to be your local printer for all these years, and we wish you all well as we look forward to some much needed time off. Over the past few weeks we have been very pleased to become acquainted with Lloyd and Nancy and their company that they have built. We want to reach out to all of you and introduce ourselves and our family Frye's Printing, inc. 1.) Offset Printing - Everyday commercial printing. This also includes in-house foiling, embossing, die-cutting and letterpress. In this department we produce large quantity commercial work as well as smaller custom and speciality work. 2.) Digital Printing - Quick turn around printing. This portion of the industry has been growing a lot and we have been doing our best to keep up with it, including installing a state of the art new Xerox machine. This department excels in quick turn and being competitive for lower quantities. 4.) Reprographics - commonly known as blueprinting. Unless you are a contractor, engineer or architect this might be a foreign concept for you, but basically we print plans for developers. 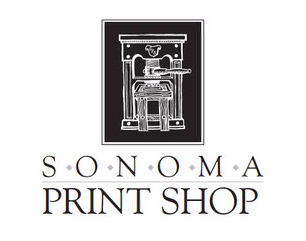 With that said, we are very excited about acquiring Sonoma Print Shop and carry on the legacy they have built. Please feel free to contact us and we will be able to pick up right where you left off with Lloyd and Nancy.